Do you know what Music Browsing Extension is? 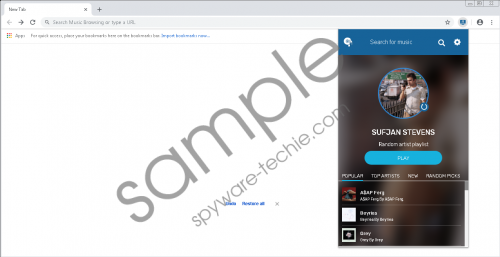 Music Browsing Extension is one of the newest music-related browser extensions that can be downloaded directly from the Chrome Web Store. This piece of software has been created as an alternative to popular music streaming services like Spotify. Unfortunately, we could not confirm that it is superior to other existing digital music services. After a thorough analysis, our experienced team of researchers has decided to classify this add-on as a potentially unwanted program. Potentially unwanted applications are not malware, but they have drawbacks and, in some cases, have bugs that do not allow them to work properly. Luckily, this is not the case with Music Browsing Extension; however, since other 100% reliable services are available on the market, it would be a sin to let this potentially unwanted program stay. If you decide to eliminate it, we are sure you will erase it without difficulty. You just need to remove the browser extension named Music Browsing Extension from your Google Chrome browser. Fortunately, this piece of software is not compatible with any other web browser. Theoretically, its new versions may work on Mozilla Firefox and Google Chrome browsers as well. As for the Music Browsing Extension distribution, it, as mentioned, can be downloaded directly from the Chrome Web Store (https://chrome.google.com/webstore/detail/music-browsing/lklcbakipdcoeclfpekcebgamelgindl). At the time of writing, there were 383,238 users who have downloaded it from this source. Of course, it is possible that alternative distribution methods are used to spread it too. Specialists say that the most likely scenario is that it travels bundled with other applications. Have you recently installed new software on your computer? If so, you must have installed Music Browsing Extension next to it. Also, you could have installed it by clicking on pop-ups promoting it. It is very likely that they are shown to users when they open certain websites on the web. Potentially unwanted applications are not real threats, but, of course, it is always better to use 100% legitimate applications, so we highly recommend that you install security software on your computer so that you could recognize untrustworthy programs. If you arrive at a decision to remove Music Browsing Extension, feel free to use instructions provided below, especially if you are a less experienced user, because it may be quite complicated to remove it for those users who have never erased any browser extension before. Alternatively, we would recommend scanning your system with an antimalware scanner to delete it automatically. Open More tools and click Extensions. Select the browser extension named Music Browsing Extension. Music Browsing Extension is a program advertised as an online music streaming service, but, to be frank, it cannot compare with similar existing services because it has several drawbacks that make it a potentially unwanted application. If you have not installed it yet, we would recommend that you choose another program instead. In case you still decide to give it a try, you will find your default search provider changed right after installing it on your PC, be ready for that. Tags: delete Music Browsing Extension, Music Browsing Extension, remove Music Browsing Extension.